There's a thought that I really enjoy when I see an old car. At one point in time, someone bought that from a car lot and it was fresh out of the wrapper. So that really beat up old corolla you see, someone bought that brand new. 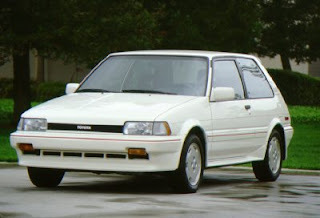 So today's daily memory is for my first car a 1986 toyota corolla FX. It was a great little beater. Knowing what I know now I would have taken better care of it and I may have been driving it today. Live and learn. It was a fun little whip. It was a manual, my instruction from my dad on how to drive was, here are the keys, you have half an hour to make it to school. I made it! Didn't kill it once, roasted the tires though, but within a few days I was pretty comfortable with it.